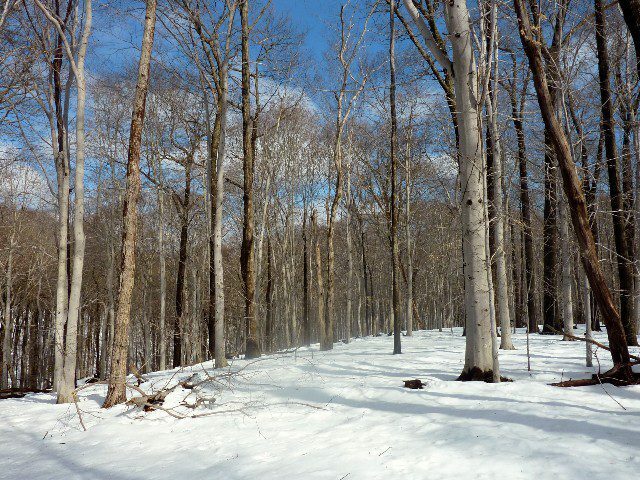 Even though much of the snow has melted and what is left are gray and black piles in parking lots, a Wednesday walk at the Delaware Nature Society’s Flint Woods Preserve revealed the beauty of winter and a few hints at spring. A view of the Delaware Nature Society's Flint Woods Preserve. Photo by Sally O'Byrne. It was obvious that animals were finding food – we found evidence of eating and the eaten. A crabapple tree had the remnants of eaten fruits and discarded seeds beneath – the birds had been busy. At the edge of a field we found where a fox had been digging into the snow. 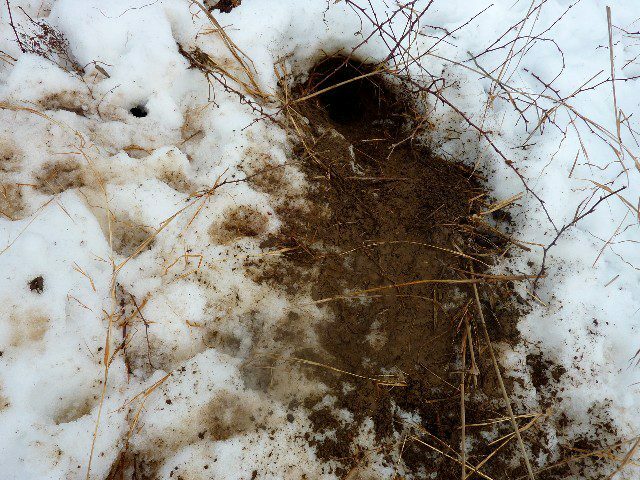 A fairly deep hole made us wonder if the fox had chased a rodent or maybe smelled it through the snow. Did he catch it? You bet. We found the guts of the little guy close by. Why did it leave that part behind? A fox was busy digging for a meal. Photo by Sally O'Byrne. A small gut pile was next to the hole dug by the fox. We wondered why it didn't eat this part. Photo by Sally O'Byrne. We hear about squirrels burying nuts, but a pile of nut shells let us know that one squirrel had dug through the snow to find them. Bill the Land Manager has an active bird feeder. A Carolina Wren was sitting beneath the feeder and must have been hungry since he let us get quite close. 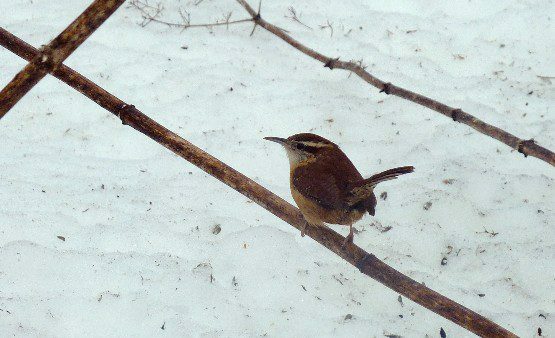 A Carolina Wren is reluctant to flush from below a bird feeder, even though we approached closely. Photo by Sally O'Byrne. The sun came out and the we were struck by the beauty of the woods, even if most folks are getting sick of the white stuff. 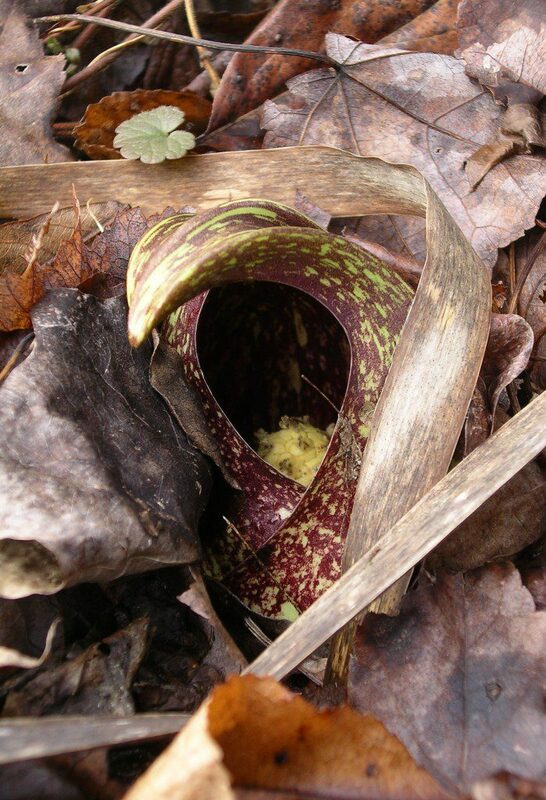 The melting was obvious and many wet areas were exposed which held one of the first flowers of the year, a skunk cabbage, which was in bloom. We also found a few invertebrates that were active on this winter day. We ran into a web that had an active spider. The spider moved onto the web when we brushed it. 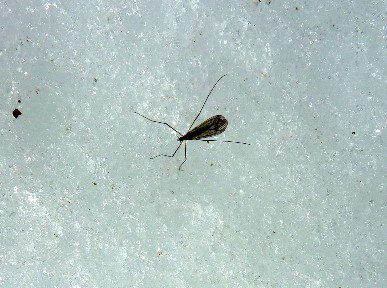 We also found an insect that flew and looked like a mosquito, but turned out to be a Winter Crane Fly. I chased it down until it landed on the snow. The ground was so wet that several mature trees that seemed perfectly healthy had fallen over – their roots were not deep enough to hold them. With upcoming storms and remaining winter winds, how many more might fall? One beauty – a tuliptree (liriodendrum tulipifera) – looked stable and very grand – a giant in this forest. 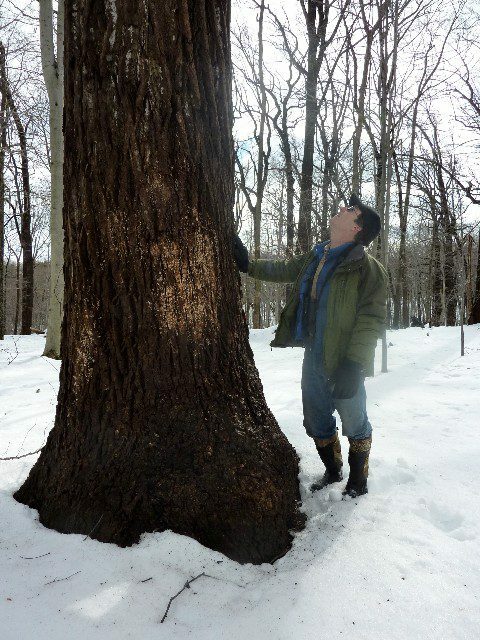 Bill stands next to a tuliptree in the Flint Woods Preserve. Photo by Sally O'Byrne. With corn stubble poking through the snow, the landscape still looked in the grip of winter. The calendar tells us that spring is less than a month away. The changes will be coming soon….. promise! Flint Woods bird surveys take place each Wednesday morning and are free. If you are interested in helping, please call (302) 239-2334 ext. 115. The preserve is closed to the public except for guided walks such as this. 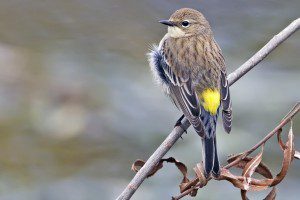 Register for the Spring Migration Birding Series, which will include a visit to the Delaware Nature Society’s Flint Woods Preserve. The series begins on March 12 and includes 6 walks in March and April. For more information, click here. Earlier this week, while walking along the Wilmington Riverfront on a relatively warm day in February, I spotted a bird that most people might not expect to see in the city. 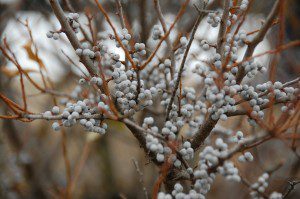 I wasn’t surprised to see it, though, since the plantings along the Riverfront include northern bayberry (Morella pensylvanica), one of this bird’s favorite winter foods. Identified by the distinctive yellow patch on their rump, these warblers are fond of the waxy, white fruit of the bayberry and its southern counterpart, the wax myrtle (Morella cerifera). Every year these birds winter in Delaware and can easily be found along the coast where Morella is prolific. They also winter in the Midwest and southeastern U.S., although there they rely on alternate food sources such as berries of the eastern red cedar and poison ivy. I don’t expect you to run out and plant poison ivy, but bayberry is definitely garden-worthy. In the landscape, bayberry averages 9 feet tall and grows in full sun to part shade, thrives in poor, sterile, sandy soil, and even performs well in heavy clay soil. (An interesting side note: The plant also provides the scent for “baybreeze” candles.) If you like the idea of adding bayberry to your yard, plan to pick up a few of the plants at the Delaware Nature Society’s Native Plant Sale the first weekend in May. Plant it and they will come! 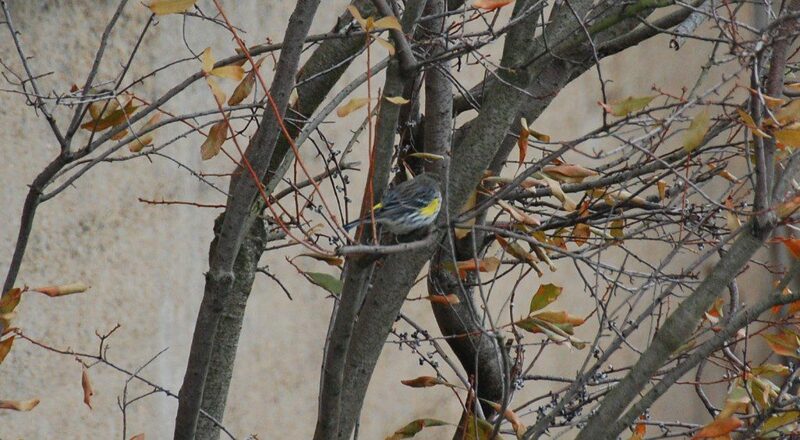 Yellow-rumped Warbler in a bayberry on the Wilmington Riverfront. Photo by John Harrod. If you would like to learn more about attracting wildlife to your property or certifying it as an official Backyard Wildlife Habitat, visit the Delaware Nature Society’s Backyard Wildlife Habitat webpage: http://www.delawarenaturesociety.org/bwh.html. Blackwater National Wildlife Refuge is a great place for a weekend getaway, not far from Wilmington near Cambridge, Maryland. This area is the “Everglades of the Delmarva Peninsula” and offers huge potential for seeing wildlife and outdoor recreation and is about a 2&1/2-hour drive from Wilmington. On a recent visit, my wife and I explored the refuge’s Wildlife Drive and public roads to the east of the refuge. Enjoy the short video I made from highlights of our afternoon visit. Thousands of Snow Geese get into the air at the slightest movement from a Bald Eagle. There are Bald Eagles around every corner, so the Snows are up a lot. I have never seen as many “Blue Geese”, a beautiful color form of Snow Goose, as I have at Blackwater. Open country birds such as American Pipits and Horned Larks were plentiful. The Horned Larks in the video were either fighting or courting. There really is a thin line between love and hate. The Northern Bobwhite was feeding on a grassy strip along the side of the road in an otherwise snowy landscape. Finally, I was unable to capture the highlight of the day on camera. When we first arrived at Blackwater, thousands of Canada Geese were in the air, spooked by something. Apparently they don’t spook as easily as Snow Geese, so whatever caused their alarm was serious. We looked up and saw an adult Golden Eagle swoop down into the geese. The eagle singled out one of the geese and was in hot pursuit, but the goose escaped unharmed. Take a trip to Blackwater for a great day of wildlife watching. A tower of icicle columns on the north side of Ashland Nature Center. The longest measured 18 feet! 2/13/10 by Derek Stoner. The after-effects of back-to-back big snowstorms is still being seen across the region. Bit by bit, the snow is diminishing and melting away. Nature’s artistry is evident in the incredible icicle formations dangling from buildings everywhere. The snowmelt from rooftops is creating some epic icicles, growing longer with each passing day. Drip by drip, each bit of melted water then re-freezes and adds to the the growing icicle. 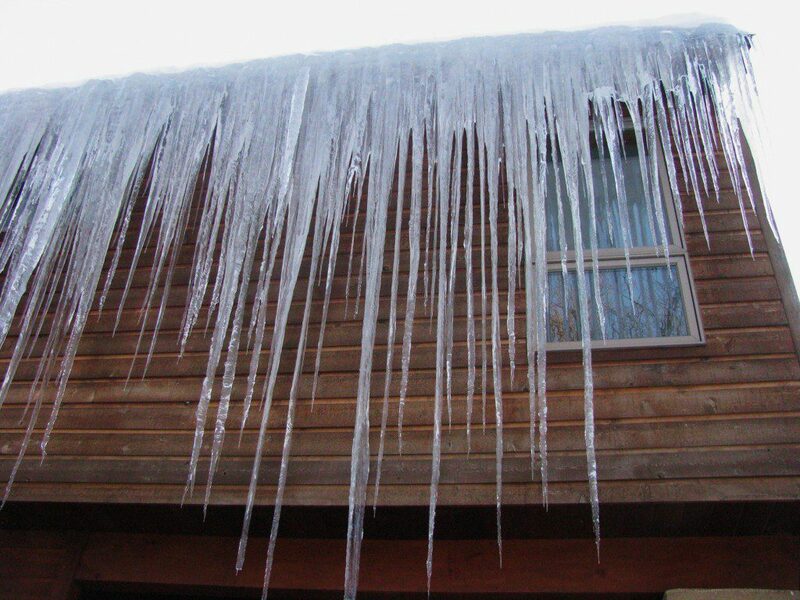 The best and biggest icicles “grow” on the north side of buildings where they are sheltered from the sun’s rays. At Ashland, one tower of ice contained mutliple icicles over 10 feet long, with the longest stretching to 18 feet! 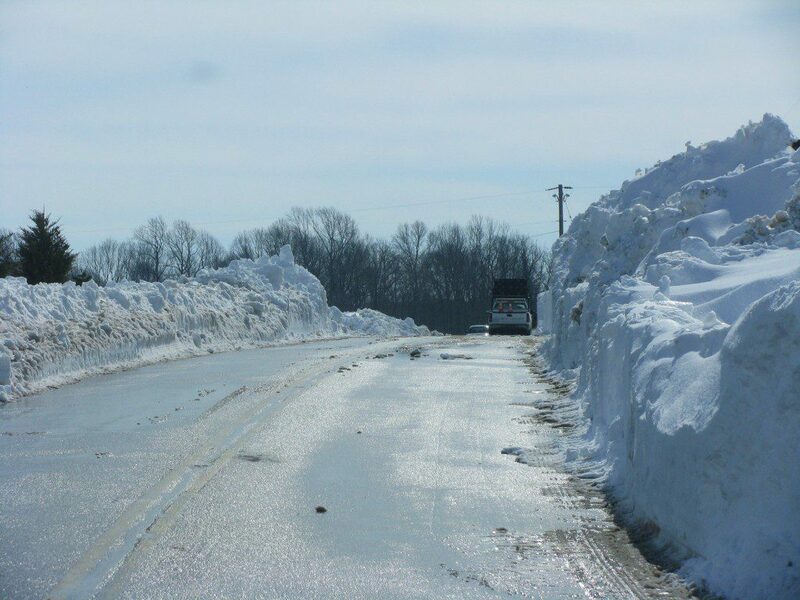 A 15-foot wall of plowed snow along Route 9, the result of high winds and drifting. 2/15/10 by Derek Stoner. A drive south along the scenic Route 9 corridor revealed a scene usually reserved for the Great Plains: major snow drifts completely closing the road. A massive DelDot tractor used a bucket as large as a pickup truck to move the snow off the roadway. One could not see over the fifteen foot wall of snow left behind, making it seem like a snow-a-phobe’s worst nightmare! The wildlife is working hard to scratch out a living– literally. 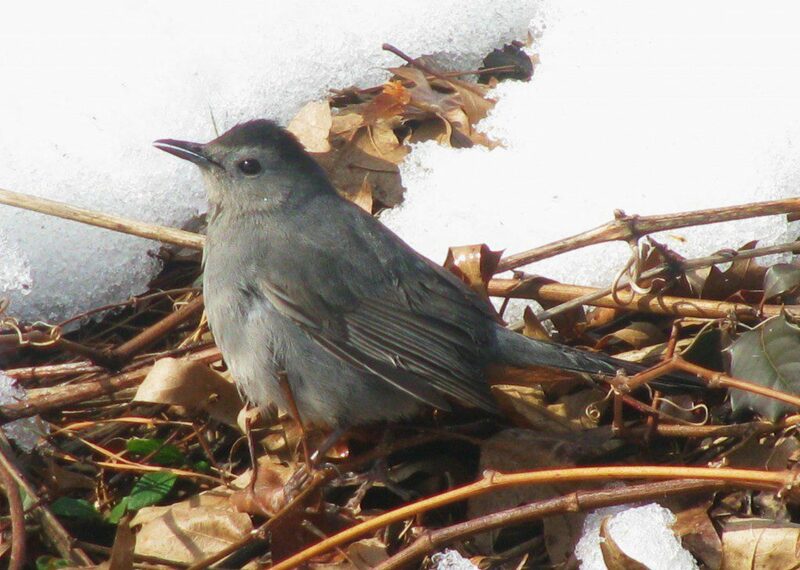 Gray Catbirds are uncommon in winter, typcially migrating further south. Some catbirds linger and feed on berries and seeds in thickets. This individual and other birds like the robin below were scratching through the exposed leaves along the edge of the road near Port Penn recently. 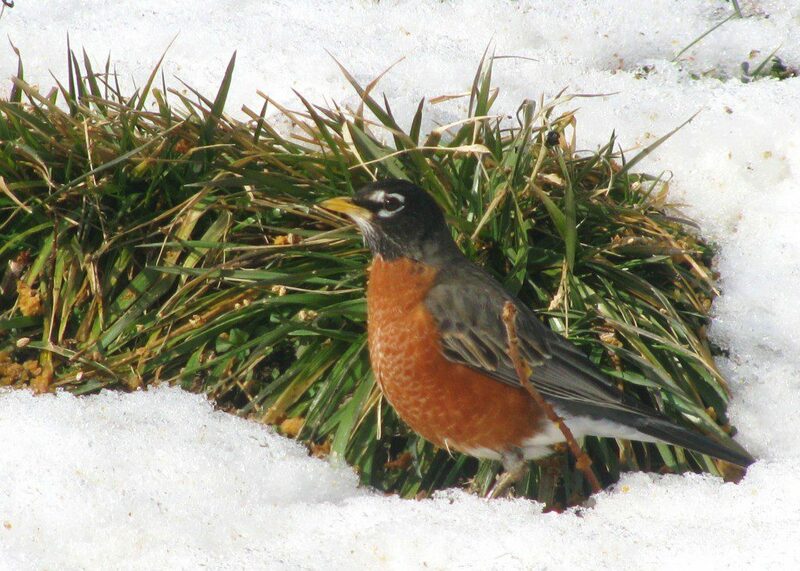 An American Robin investigates a patch of grass amidst the snow. 2/15/10 by Derek Stoner. 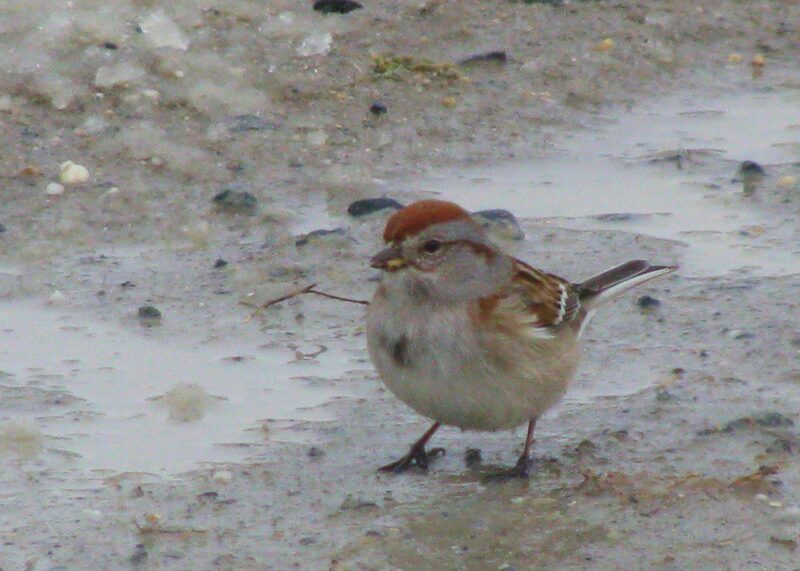 An American Tree Sparrow at Bombay Hook NWR. 2/15/10 by Derek Stoner. Another bird that is showing up at bird feeders in backyards recently is the American Tree Sparrow. This handsome sparrow typically feeds in fields of warm-season grasses, foraging for tiny seeds. With this food source buried under snow, these birds are coming to feeders for handouts of sunflowers and other large seeds. 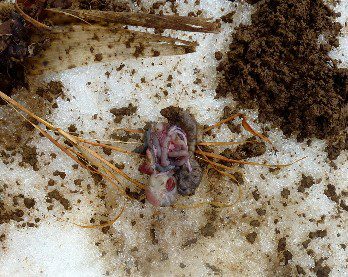 The season of snow and cold weather is a challenging one for wildlife, but most animals are adaptable enough to find what they need to survive during hard times. We can all admire wildlife for their ability to hang tough!